October is Breast Cancer Awareness month. I’m sure most of you have heard that by now. If you haven’t I’m glad I could be the one to bring it to your attention. 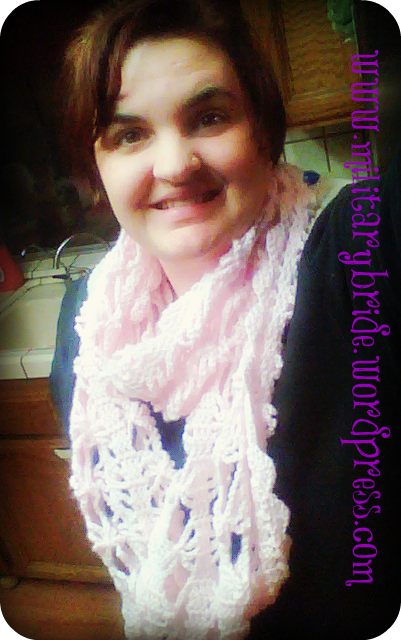 The pink infinity scarf in my picture was my latest project in crocheting. I decided to go with pink to show my support for breast cancer awareness. This is an amazingly simple crochet scarf from Caron yarns. If you would like the pattern please click here for the link. I love how beautiful the scarf turned out. I think I will also make one in a hot pink to show support. My Grandmother is a cancer survivor. A few years ago she was diagnosed with invasive cancer and went through major chemotherapy. After many many nights filled with prayer, and several scary calls, the cancer went into remission. Sadly in the past few months she was diagnosed with noninvasive cancer. She is currently in her second round of radiation, and thankfully it is going well so far. My Grandma thankfully knew the importance of yearly check ups and the cancer was found in a curable amount of time. It has made me aware of the thousands of women AND men who face breast cancer every year. I’m proud of my grandmother. She has not given up fighting, and enjoys the little things in life. Treatment has been hard. There were days when we prayed that she would pull through. There were days I’m sure my grandmother didn’t want to get out of bed. Like all of the women in my family, she is a fighter. Cancer chances are increased with drinking and genetics. Exercise and eating healthy can lower your chances of cancer. Breastfeeding lowers your chances of getting cancer. Posted in blogging, cancer, family, life, Life Lessons, military family, milspouse, navy, photo, Uncategorized, veteran and tagged awareness, breast cancer, breast cancer awareness, cancer, chemotherapy, craft, crafting, crochet, family, fight like a girl, fighters, infinity scarf, life, military baby, military life, military wife, milspouse, pink, pink ribbon, scarf, survivors. Bookmark the permalink.